HONG KONG—Doctors, lawyers, and politicians gathered to discuss effective responses to the practice of forced, live organ harvesting in China at a forum in the Hong Kong Legislative Council (LegCo) building on Nov. 28. 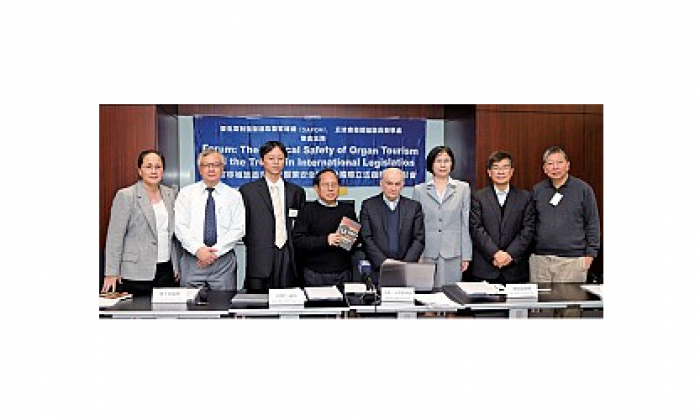 The forum on “Medical Safety and the International Legislation Trend of Organ Tourism” was held by Doctors Against Forced Organ Harvesting (DAFOH), an international human rights group headquartered in Washington, D.C.
Canadian human rights lawyer and Nobel Peace Prize nominee Mr. David Matas flew into Hong Kong to speak at the forum. Members of LegCo and pan-democrats (pro-democracy politicians who agree not to field candidates against one another) also attended, and democratic LegCo members considered motioning for a restriction of live organ harvesting from Falun Gong practitioners. Matas appealed to Hong Kong and Taiwan to join hands to stop the crime of forced organ harvesting from live Falun Gong practitioners and other prisoners of conscience. Matas was nominated for the Nobel Peace Prize in 2010 for his unrelenting joint efforts with former Canadian Secretary of State (Asia-Pacific) David Kilgour in investigating, exposing, and attempting to stop the Chinese Communist Party’s (CCP) practice of organ harvesting. At the forum, he shared his years of investigation and analysis and supplied solid proof of the CCP’s crime. He pointed out that in July 2005, then-Deputy Health Minister Huang Jiefu admitted for the first time that 95 percent of organ transplants in China came from executed prisoners. However, the use of the death penalty has decreased in recent years while the number of organ transplants remained the same. According to Matas, this means that more organs are being taken from Falun Gong practitioners and other prisoners of conscience. He added that the CCP’s organ harvesting is a global problem. “China’s transplant staff go all over the world, and transplant patients are also coming from all over the world. The potential problems of organ transplant tourism are everywhere,” Matas said at the forum. Matas arrived in Hong Kong after attending a similar event in Taiwan. He said that there are many common points between Taiwan and Hong Kong, which means they could play leading roles in stopping live organ harvesting. Taiwan and Hong Kong set examples for China in many ways, he said. Standing firm against live organ harvesting is setting another example and playing a leading role so that people in other countries will follow Taiwan and Hong Kong in speaking up. Matas said that Hong Kong is in a unique position, partly because of its legislative power and partly because it holds the key to break the CCP’s cover-up for its organ harvesting crime—Hong Kong’s registration list of liver transplants. Every hospital in China has to report cases of liver transplants to Hong Kong’s Queen Mary Hospital, he explained. This data was open to the public in the past, but when Matas and other researchers started to use it as references, the database was closed. Matas asked LegCo member Albert Ho whether the Legco and its members could investigate the topic. Lee Cheuk-yan, one of several pan-democrat LegCo members who attended the forum, appealed to the whole world to stop this inhuman crime of the CCP. DAFOH Asian legal consultant Theresa Zhu said that those who want to cover up the truth are the murderers and the accomplices. She appealed to everyone to spread the truth and expose the culprits. Zhu mentioned that 17 counties in Taiwan have passed interim proposals to condemn CCP’s live organ harvesting from Falun Gong practitioners. She urged Hong Kong LegCo members to raise similar motions at the Legislative Council. Lee, who sat next to her at the forum, said they would consider it. Another pan-democrat, Legco member Sin Chung-kai, was shocked to learn that the CCP army participated in organ harvesting. “If it were not happening in the military hospitals, other organizations simply would not dare to do this,” Sin said, adding that international communities should work together to stem illegal organ transplants. Vice chairman and spokesman of Taiwan International Organ Transplantation Care Association Mr. Huang Shi-wei listed cases of organ transplants in China with unknown sources. Huang also said that international communities have changed their attitudes toward overseas transplants. Most significantly, the 2008 “Declaration of Istanbul” prohibits organ transplant tourism, commercializing organ transplants, and illegal trading of organs. Forum co-organizer and LegCo member Leung Kwok-hung discussed the significance of exposing the CCP’s organ harvesting crime. Moderator and LegCo member Albert Ho said he learned from the seminar that 90 percent of illegal organ harvesting took place in mainland China, and it was organized and manipulated by officials. He condemned the crime as extremely cruel and inhuman and said that international communities need to exert further pressure to demand that the CCP disclose the truth. “They have to be absolutely transparent in the registration of the sources of organs,” Ho said. A petition organized by a medical advocacy group calls on the Chinese Communist Party to cease the harvesting of organs from prisoners of conscience.